What do you do about that dripping faucet and running toilet? Options: Fix it or replace it? That’s the real question isn’t it? What’s the problem with a continuously running toilet? Let’s address the toilet issue. If it’s running then you are wasting a lot of water, which can result in hundreds of dollars in charges on your water bill. If you have a well you might be thinking, “I don’t have to worry. My water is free.” This couldn’t be further from the truth. That continuous dripping causes your pump to run more often. This uses more electricity. In addition, with the increased use your water pump wears out faster. On top of that, if you treat your water you’re burning through your chemicals at a much faster rate. 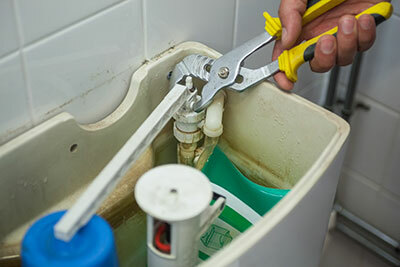 Rule of thumb for toilets: If the repair is under $250 fix it. If it’s over $250 replace it. It’s not worth spending more on fixing the toilet than replacing it. If you do nothing, the amount you waste on water, chemicals and electricity could be higher than the toilet’s replacement cost. Therefore, unless you have a one piece toilet or a very high end type toilet, fix it. And know that any leaks won’t simply go away. They will only get worse over time. We’ll assume you’re reading this because your toilet won’t stop running. You’ve come to the right place. Before we start, it’s important to know how your toilet works. If you’ve never lifted the lid to the toilet tank, all you know is that when you push down on the lever, the toilet magically flushes. Fortunately, the inner workings of a toilet are much simpler to observe than the workings of your car engine. Lift the lid to the tank and watch what happens behind the scenes as you flush the toilet. Anatomy of a properly working toilet. What’s inside the tank? Observe where the “flushing lever” (the familiar part outside the tank) connects to a long arm with a “chain” on the end of it. That chain connects to a “flapper” which covers the drain hole. 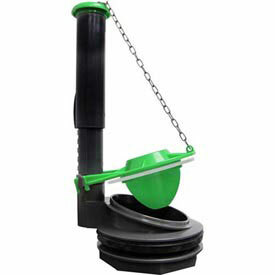 When you push down on the lever, the arm inside lifts, pulling the chain until it lifts the flapper, opening the drain causing the water in the tank to rapidly drain down into the toilet, washing its contents away. As the water from the tank runs out, notice how a “float” descends to the bottom of the tank. This signals the water tank to begin refilling. As the water refills, the float ascends. Once the float as completely ascended, it signals the tank to stop filling. The tank is now full and ready for the next flush. There’s also an “overflow tube” which sets the high water mark. What makes the toilet leak? The culprit could be the chain. If it’s too short it will hold the flapper up, creating a permanent opening which causes the toilet to continuously drain. If it’s too long, the excess chain could wedge itself under the flapper, creating a permanent opening which causes the toilet to continuously drain. You’ll want to adjust the length of the chain to make it just right. Do this by trial and error. The culprit could be the flapper. Does the flapper look warped? If so, it’s creating a permanent opening which causes the toilet to continuously drain. Is the flapper hinge broken? This could prevent the flapper from landing correctly over the water drain hole creating a permanent opening which causes the toilet to continuously drain. Is there mineral build-up on the flapper? Such build-up is probably creating a permanent opening which causes the toilet to continuously drain. Begin by cleaning off any mineral deposit from the flapper. If the flapper still does not completely close, you may need to get a new flapper. Make sure you get one that has a chain attachment in the center of the flapper and not on the edge. The ones that have a chain pulling from the edge of the flapper tend to warp sooner. The culprit could be the float. A properly positioned float causes the tank to stop filling when the water is just below the overflow pipe. If the float is adjusted poorly, so that the water begins to flow into the overflow pipe before the float turns it off, it will flow continuously. 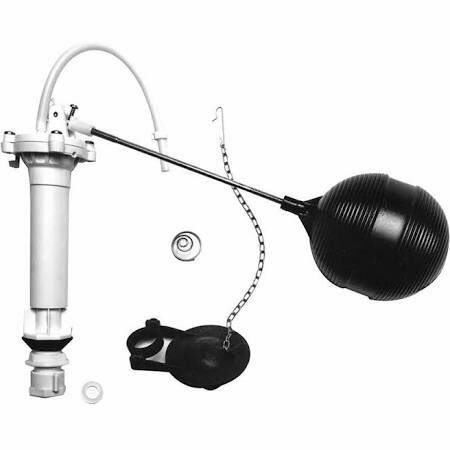 In this case, you can actually bend the rod connected to the float, so that the float is lower in the water, causing the water to shut off before it gets to the overflow pipe. Most hardware stores of any size have a plumbing department, and you can find toilet kits containing some or all of the key replacement parts mentioned above. Following the instructions above should bring you success in 90% of the situations with a toilet that won’t stop running. If you’re a DIY person and love figuring things out, you’re likely to be successful and enjoy a feeling of accomplishment and empowerment! Before working on your toilet, turn off the water! The shut-off valve will be located somewhere behind the toilet seat, underneath the water tank. And be careful not to force any fittings. Scenario: You’ve got a massive pipe wrench and you apply too much force to some part causing it to break, or you accidentally drop your massive pipe wrench into the water tank, breaking the tank and causing a flood! When to call The Plumbing Artisans. Bending the float rod does not cause the float to stop the water flow before it reaches the overflow pipe. You can’t locate replacement parts that fit your toilet. You tried all the above suggestions and your toilet is still running. You’ve got a unique kind of toilet and the inside doesn’t look anything like what we’ve been describing. You’d rather enjoy your weekend doing something you love to do instead of devoting it to learning about your toilet. Consider the time you will spend in this project. Between the trip to the hardware store (possibly multiple hardware stores) to locate parts, a possible return trip if you got the wrong parts, the time it takes to just figure out how your toilet works and what’s causing the leak, and the time to troubleshoot the various issues… You’ll be likely spending 2-4 hours. And this assumes you fix it right the first time and do not need to repeat this drill again. If you break something, all bets are off, and so is your toilet! Call The Plumbing Artisans instead. We will be able to quickly repair your toilet, freeing you to go do something you enjoy on the weekend! Stop that endlessly running toilet now. Save money. Experience beautiful silence again, without those constant, disturbing water pipe sounds.